Western Americana: History of the American West: Riverboat Travel on the Missouri and the Opening of the American West. Riverboat Travel on the Missouri and the Opening of the American West. When President Thomas Jefferson sent Meriwether Lewis and William Clark to explore the newly acquired Louisiana Purchase in 1804, one of the goals was to find a water route across the continent to the Pacific Coast. 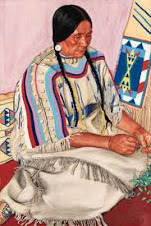 They understood that easier access to trade in the Pacific would be good for the economic well being of the new United States of America. 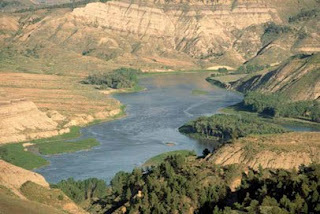 Lewis and Clark did not find a water route to the Pacific Coast, but they noted the importance of developing the Missouri River as a trade link to the Mountain West. By 1850s, the Missouri River connected the American West to important trade center in the South and East. Goods and supplies traveled on paddle steamers either from the port of New Orleans up the Mississippi River to the Missouri River or from the New York City harbor up the Hudson through the Erie Canal to the Great Lakes. And then from the southern end of Lake Michigan, steamboats could navigate into the Illinois River and on to the Mississippi and Missouri Rivers. Without the river link to the West, economic development would have been difficult if not impossible. Steamboats started navigation of inland rivers as early as 1811 when the stern-wheeler New Orleans made its maiden voyage down the Ohio to the Mississippi River. The New Orleans was built in Pittsburg for $40,000. It was 116 feet long and 371 tons. The vessel was slow and somewhat cumbersome, patterned after river steamers on the waters of the eastern seaboard. Technological advances over the next couple of decades produced fast maneuverable high-pressure-steam driven paddle wheelers with low drafts that could easily haul large amounts of freight on rivers like the Missouri. Steam wheelers started up the Missouri in the late 1850s. At first, paddle wheelers did not venture far up the Missouri, riverboat captains were afraid their boats were not suited for the shallow waters. As improvements were made to the vessels, captains maneuvered farther inland on the river until they reached the upper Missouri. At the terminus of the navigable waters of the Missouri, (in present day central Montana) Alexander Culbertson of the American Fur Company established Fort Benton 1846. 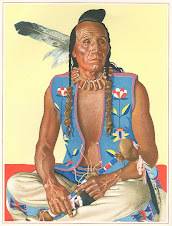 Evidently he did so at the request of the Blackfoot who believed a trading facility on the north side of the Missouri River would be advantageous to their trading enterprise. But it was not until 1859 that steamboats started to visit Fort Benton on a regular bases. In that year the Chippewa, especially designed for the shallower up stream channel, was the first to pull into the levee at Fort Benton. For the next decade and a half, Fort Benton was very important to the interior economic development of the Northern Rockies. The possibility of lucrative trade on the upper Missouri was incentive for individuals to use their capital to construct bigger and better riverboats. This was especially true in the 1850s when the government let out contracts to carry annuities to various Indian Tribes as required by treaty. The government offered attractive contracts to different steamboat companies, the winners were usually the companies who had the most efficient boats and who had the best lobbyists in Washington. 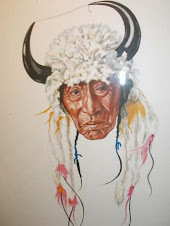 When the Chippewa arrived at Fort Benton the cargo was Native American annuities. The development of Fort Benton as an inland port and depot for goods coincided with the discovery of gold in Montana. In 1862, miners found gold in Grasshopper Creek; the town of Bannock soon grew along the creek to accommodate a growing population of gold seekers in the Beaverhead Valley. After the initial strike, enterprising individuals found gold in streams in other parts of the valley bringing more emigrants and the growth of new towns like Virginia City and Helena, the capital of present-day of Montana. For a time, the gold rush turned Fort Benton into one of the busiest river ports in the nation. Boats arrived on a regular basis carrying passengers, equipment and supplies and returned down river carrying gold bullion, hides and wool. Fort Benton also became important to the economic growth of Western Montana, hundreds of miles from the Missouri. 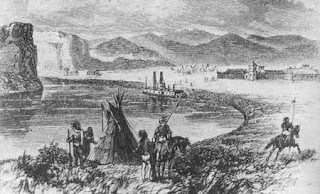 From Fort Benton, wagons hauled freight overland to the various cantonments where traders, miners, and eventually settlers, bought their supplies. 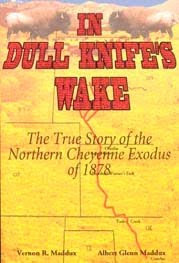 As early as 1850, John Owen started a trading post in the Bitterroot Valley, 400 miles from Fort Benton. 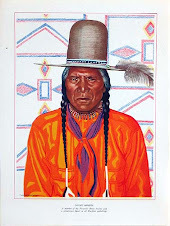 At that time, most of his customers were men who still were active in the fur trade, but who also found a new line of work in trading with emigrants on the on the Oregon Trail. Before Owen built his fort, he was a sutler at Fort Leavenworth. He left the fort with a rifle regiment, who was headed to Oregon. The unit wintered at Fort Hall, where Owen resigned his sutler position. It is most likely during his stay at Fort Hall that Owen met and started associating with men who traded on the Oregon Trail. The stretch of the Oregon Trail between Fort Laramie and Fort Hall was long and dry. By the time the wagon trains made it as far as Fort Hall, in present day Idaho, their oxen and cattle were tired and worn out from a lack of good grasses on the dry Plains.The traders bought the cattle at low prices and took them north into Montana, especially into the Bitterroot Valley, where the winters were mild and where there was plenty of grass. The next summer they herded the fattened and rested cattle back to the Oregon Trail or the “Road” as the trail was known, and traded to a new season of emigrants—they typically traded one fattened cow or oxen for two or three tired animals. ( as a side note-- these men started the first cattle herds in Montana) Owen followed the retired fur traders to the Bitterroot Valley, where he saw an economic opportunity to sell trade items and supplies to the numerous mountain men and their families who resided in the valley. 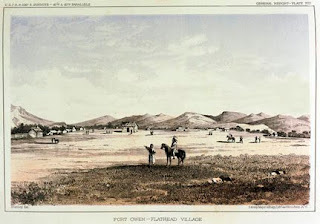 (Almost all of these families were interracial; mountain men tended to cohabitate with Native women, many becoming wives) As soon as the steam wheelers started pulling into the docks at Fort Benton, John Owen started making regular trips to the port to receive his supplies. He hauled the freight in wagons over the mountains to the Bitterroot Valley. To facilitate travel from Fort Benton into the Pacific Northwest, the United States Congress, at the urging of Lieutenant John Mullen, appropriated funds for a road from Fort Benton to Columbia River in 1857. By so doing, there would finally be an easily assessable trade route from one end of the continent to the other. John Mullen led the project. Construction began in 1859; Mullen and his crew completed the project in 1860. The road not only connected Fort Benton to the Pacific Northwest, but to gold fields in Montana and Idaho. One of the perils of Navigating on inland rivers was that paddle wheelers were vulnerable to accidents that could damage a cargo or destroy the vessel. The Missouri River was especially dangerous because of its shallow waters, swift currents, and narrow navigable channel, which often shifted making it difficult for riverboat captains to navigate; many landed their paddle-wheelers on sand bars. And, sometimes the only way to launch from a sand bar was to wait until the river was once again in high water. The Missouri was also dangerous because of dead trees and snags that could rip through the bottom of the boats. Investors who put capital into the construction of steam wheelers had to realize immediate profit before an accident ruined their economic venture. 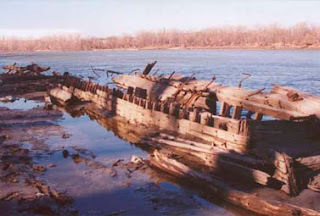 A testimony to the dangerous navigation of the Missouri is the numerous wrecks that still litter the bottom on the river, now deep in mud and sand. For example in 2004, up out of the shallow murky waters of the Missouri, emerged the steamboat Montana, a wreck of over 120 years. 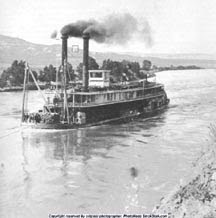 The Montana was one of three “mega” boats constructed in 1879 to operate in the upper Missouri. It was the largest boat ever to travel the Mississippi and Missouri Rivers. It was 283 feet long, 100 feet larger than most paddle wheelers of the day. In June of 1879, the Montana unloaded 600 tons of cargo at the levee at Fort Benton. This was the largest cargo ever deposited at Fort Benton. For a brief period, the Montana out paced the railroads in supplying the upper Missouri and paid off investors handsomely. 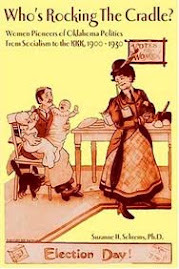 But, the Montana was the last gasp of riverboat travel in the upper Missouri, steamboat traffic cease to exist by 1880. After only six years of operation, the Montana hit a railroad bridge at St. Charles, Missouri. The captain beached the steamer on the southern shore, where over time, it sank into the mud. It is ironic that a railroad bridge caused the demise of the Montana. The mishap symbolized the end of the importance of river transportation to western commerce, and the beginning of the importance of rail traffic in the national and international economy. The era of steam wheelers running the Missouri lasted only as long as there was no competition in transporting freight to the West. With the passage of the Pacific Railroad act in 1862, and the subsequent construction and completion of the transcontinental railroad, river traffic to Fort Benton began to decline. In the summer of 1867, a record 39 boats docked at the Fort. By 1874, only three made it up river. The Railroads took over where the steamboats left off, supplying goods and transporting people to the American West.